More importantly, Anderson exposed that only 43% of the sales were among the books carried by the traditional books stores. 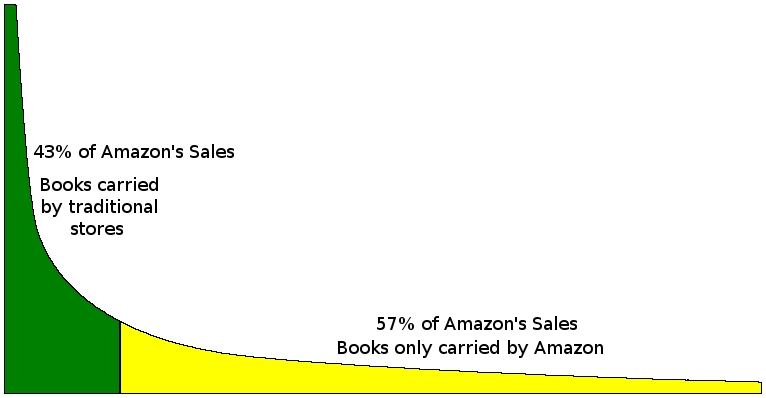 57% of Amazon’s sales came from the “long tail” of books that were not offered by traditional books stores. In other words, the unpopular fringe is actually the majority. The traditional book stores did not carry that 57% of books because, for them, sales were too low to be profitable. Amazon utilized the Internet to be more efficient so they could profitably sell a wider range of books. Ron Paul’s success is driven by the low cost of communication over the Internet and grassroots supporters evangelically spreading the message for free. Normal party politics tries to aggregate people into groups to win voting blocks. Seeing people as part of a group is depersonalizing, it strips them of their true identity. Amazon.com gives readers the freedom to choose from a selection of titles that traditional book stores never considered desirable. In political terms they were disenfranchised voters. Ron Paul’s message of freedom speaks to the smallest minority of all, the individual. Ron Paul speaks to you. And by definition, there are always more individuals than groups. Several of the most hotly contended issues of our day revolve around one group wanting different treatment than another group. Gays want to openly serve in the military and get married. Atheists want government to forcibly remove religion from all public life. Some Christians want their religion actively supported by government. Other Christians want their religion protected from atheists trying to restrict them from practicing and other religions want the government to promote their religion. Women, blacks, and Hispanics want preferential consideration for admission to colleges and hiring for jobs. Making one group happy always involves harming another. It just spirals out of control and no one is satisfied. Ron Paul’s solution, the Constitutional solution, is to treat everyone as an individual. This gives everyone the most freedom and the most security. Allowing individuals to choose for themselves reaches more people than treating people as groups. Ron Paul’s message taps into the long tail of voters. In the USA, more than 50% of registered voters actually vote in a presidential election. In primaries the average turn out is 20%. If Ron Paul can get 25% of the non-voting long tail to show up and vote for him, he will have more votes in the primary than all the other candidates combined. Realistically, Ron Paul only needs 5% of those untapped voters to win in the primaries. The old thinking politicians believe the non-voters just don’t care and won’t show up. More likely the non-voters don’t care for what they were offered by the old politicians. This is why the media and old politicians keep claiming the obviously large number of Ron Paul supporters don’t exist. The old thinkers measure the old voters and don’t find many Ron Paul supporters there. They completely ignore the overwhelming majority of untapped voters then claim that Ron Paul’s large and growing support isn’t real. Traditional book stores and other retailers ignored and even ridiculed the Internet while Amazon and similar retailers tapped into the enormous unserved market. The traditional book sellers didn’t even see it coming when Amazon became the largest retailer of books. The traditional book sellers were fighting over the existing market and ignoring an even larger market. The online retailers offered what no one else could and grew the market. Not only did the online retailers offer lower prices than the traditional stores, they offered a wider selection that was easier to search. The Ron Paul Revolution is doing the same thing. 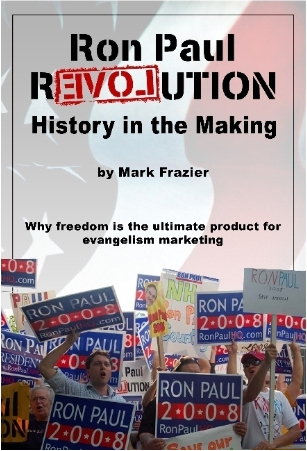 Evangelism Marketing is spreading the message to an untapped audience and the lower cost allows the message to spread everywhere else for far less expense than the other politicians can afford. 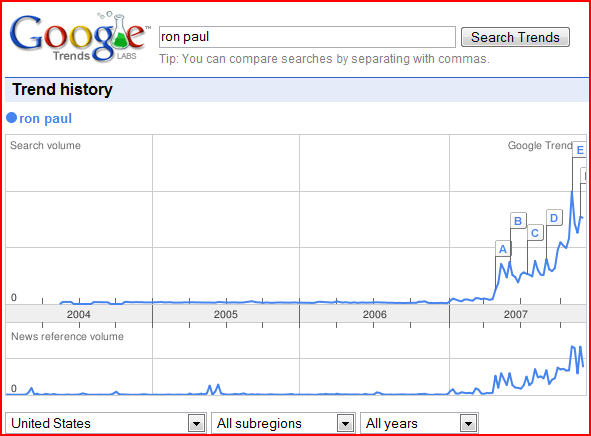 The Ron Paul Revolution is growing exponentially the same way the Internet did.